• The engine coolant temperature gauge reaches the maximum, or a loss of engine power is experienced. (For example, the vehicle speed does not increase.) • Steam comes out from under the hood. and turn off the air conditioning system, and then stop the engine. Carefully lift the hood after the steam subsides. The coolant level is satisfactory if it is between the “F” and “L” lines on the reservoir. conditioning system on to check that the radiator cooling fans operate and to check for coolant leaks from the radiator or hoses. The fans operate when the air conditioning system is turned on immediately after a cold start. Confirm that the fans are operating by checking the fan sound and air flow. If it is difficult to check these, turn the air conditioning system on and off repeatedly. Stop the engine immediately and contact your Toyota dealer. Have the vehicle inspected at the nearest Toyota dealer. 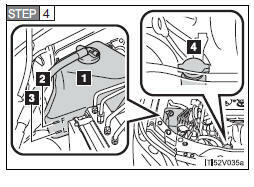 • If steam is seen coming from under the hood, do not open the hood until the steam has subsided. The engine compartment may be very hot, causing serious injury such as burns. • Keep hands and clothing (especially a tie, a scarf or a muffler) away from the fans and belts. Failure to do so may cause the hands or clothing to be caught, resulting in serious injury. 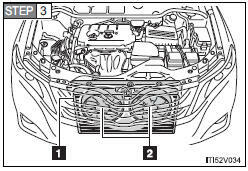 • Do not loosen the radiator cap while the engine and radiator are hot. Serious injury, such as burns, may result from hot coolant and steam released under pressure. Wait until the engine has cooled down before adding engine coolant. When adding coolant, do so slowly. Adding cool coolant to a hot engine too quickly can cause damage to the engine. 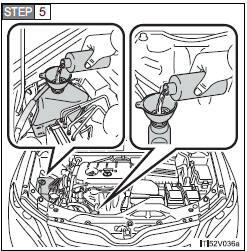 • Avoid contaminating the coolant with foreign matter (such as sand or dust etc.). • Do not use commercially available coolant additives.